Are you ready for Yoga Meets Art: An Evening of Inspiration for Joyful Living? Naomi and I collaborated to elicit the attention of your inner creativity, desires and inspiration for living with joy. What does joy feel like in the body? What does joy look like in art? This was an exciting contribution to Idaho Yoga Week. 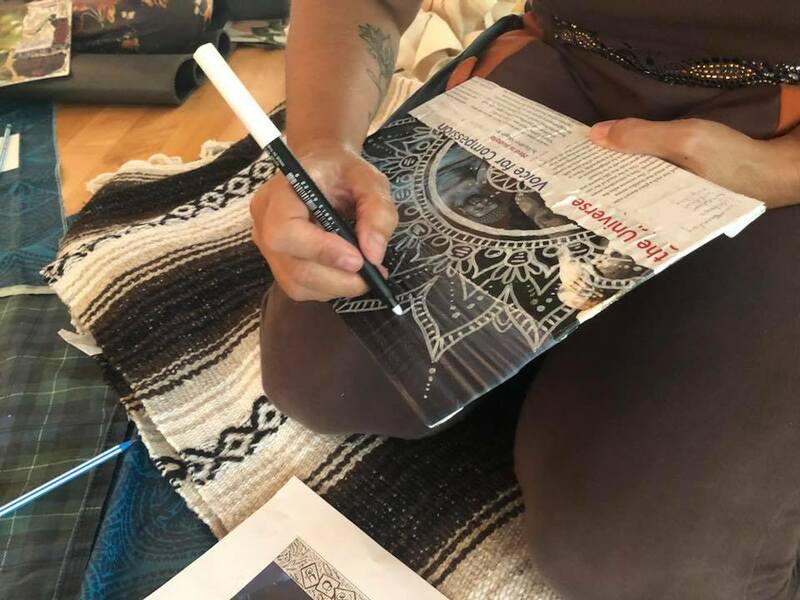 Naomi began with a short talk and heartfelt yoga nidra practice (guided meditation) and I led the class through a collage and mandala creation. The idea behind the scavenger hunts is to give the community a fun way to interact with the city and maybe learn something new while contributing photos to the Connect With Boise project. I won't be able to do this series of paintings without you, so I will be giving away an original painting to one lucky person per scavenger hunt as a thank you for contributing to the project. 4. Tag your friends! The more photos we get, the bigger, better and more representative the paintings will be. 5. WIN AN ORIGINAL PAINTING! That's right, if you finish the scavenger hunt within the deadline and tag a friend you'll be entered into a drawing to win an original painting with your photos in it from the Connect With Boise series valued at up to $200. HiNT: If your Instagram profile is private I won’t see your photos, but you can email them to me if you’d still like to participate at meg@connectwithmeg.com. The first scavenger hunt is launching in May. The plan for the rest of the year is to post new scavenger hunts bi-monthly, so keep an eye out or subscribe to my newsletter to get project updates and reminders. Other Details: By doing the Boise History Scavenger Hunts and using the #ConnectWithBoise hashtag you are implying that you are giving me consent to use your photos for the purpose of the Connect With Boise project and paintings. If you'd like to do the scavenger hunt but don't want your photos to be used, please make note of it in the comments or don't use the hashtag. Alright! This is my first time trying a scavenger hunt so please send me feedback on how it works, what you all think and how I can improve. Thanks in advance! 4. Tag a friend! The more photos we get, the bigger, better and more representative the paintings will be. 5. Complete by the deadline. That's it! By following the directions above, you are automatically entered into the drawing for an original painting with your photos in it from the Connect With Boise series valued at up to $200. Hint: The superstructure of this building was mostly built from local sandstone and the interior has red marble from Georgia, gray marble from Alaska, green marble from Vermont, and black marble from Italy. Hint: This French-chateau style hotel built in 1900 housed both President Theodore Roosevelt and President William Howard Taft. Hint: Created in Boise in 1907 this is the first official park created in Boise and the first park in the "Ribbon of Jewels" named for prominent local women. Hint: The recently reconstructed bridge that was one of the first of it's kind to connect the north and south banks of the city for pedestrians. Hint: The 30+ mile long pathway next to the river that was created over 45 years ago. If you have any questions or concerns about how your photos will be used, please email me at meg@connectwithmeg.com, check out the other details above or see the Connect With Yoga project as an example of how these projects come together. For my First Thursday opening last week at The Mode Lounge I wanted to do something a little different. I asked my good friend and yoga teacher Corrine lead a yoga class on the outdoor patio of the lounge. It was a fun, interactive amazing experience. I also had a solo show up in The Mode Lounge based on Boise culture, so the whole evening was a blissful community endeavor. Was able to sit in on the staff meeting with the lovely ladies at Hollywood Market Yoga and take a few photos. So fun to be a part of such an amazing community. I have finally figured out how to put together newsletters and look forward to keeping you all updated on the happenings, projects and adventures of the Connect With Meg studio! It was such an honor to be asked to capture the wedding of my friends Holly and Jonas. We flew out in a tiny brush plane and landed on a dirt runway in the middle of the Idaho Wilderness. Close friends and family gathered by the Salmon river around an altar made of oars and white tulle blowing in the wind. The lighting was amazing, the people were phenomenal, and the entire day was without a doubt perfect! Congrats again Holly and Jonas, thank you for sharing your epic day with us. Super excited to have a painting in the The High Desert Museum's Art of the West Exhibit this year! If you're in the Bend area over the next month, go check it out!